Boris Johnson has said the sums of money the EU is proposing to demand from Britain for Brexit "seem to be extortionate". 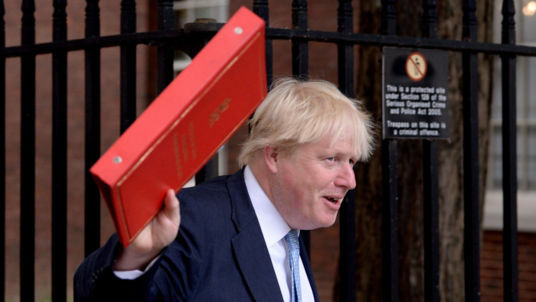 When asked in the Commons whether Brussels should be told to "go whistle" if it wants more money from Britain, the Foreign Secretary said: "I think that the sums that I have seen ... seem to me to be extortionate and I think go whistle is an entirely appropriate expression." Labour leader Jeremy Corbyn accused Mr Johnson of being "arrogant" and said the "silly remarks" were counter-productive. "Go whistle" is a phrase that means asking for something with little chance of getting it. European Commission President Jean-Claude Juncker has suggested the final bill, which covers outstanding liabilities for programmes the UK signed up to as an EU member and ongoing costs for things like staff pensions, could be around £50bn. Unconfirmed reports have claimed the final figure could be almost twice that amount. The EU has put Britain's so-called "exit bill" at tens of billions of euros, partly to cover a share of future EU budget commitments made while it was a member. Mr Johnson also revealed the Government has not made any plans for a "no deal" Brexit because the UK will get a "great deal" in the negotiations.